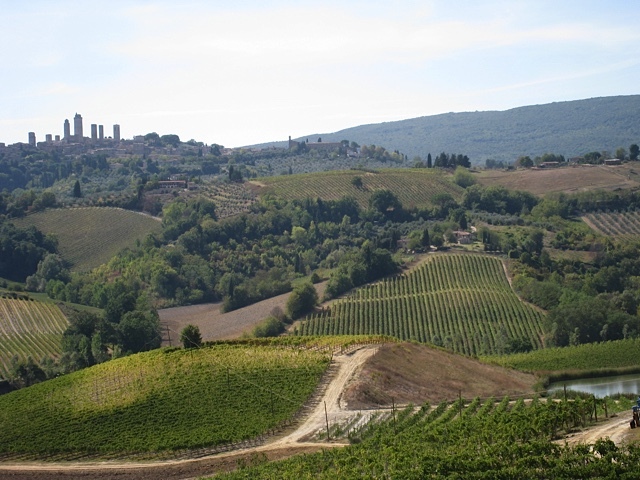 On our schedule for day two in Florence was The Best of Tuscany Tour, a full-day walking excursion in the region. Our meeting point was in front of the Santa Maria Novella train station, where we had arrived the day before. This time we walked the distance, an easy ten-minute jaunt. We found the Walkabout sign at the taxi stand and confirmed with our guide Becky that we were indeed in the right location to catch the bus. As soon as everyone boarded, we departed for our first destination, Siena, a medieval city where the Palio di Siena is held twice a year, on July 2nd and August 16th. 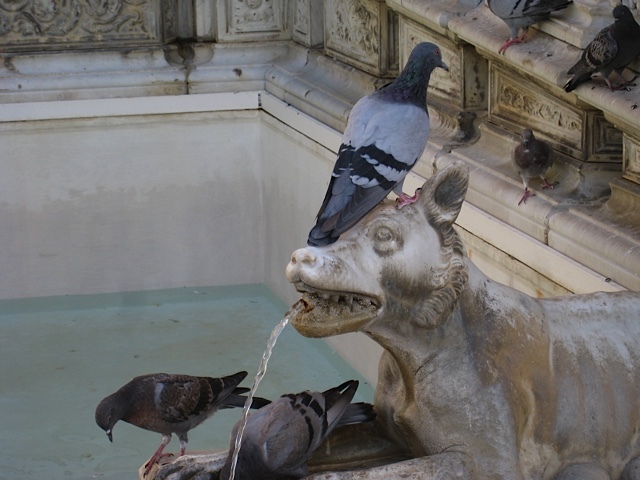 The Palio is a traditional medieval horse race run around the Piazza del Campo. The event is televised and draws large crowds to watch ten horses and their riders, dressed in colors that represent ten of the seventeen contrade (city wards), vie for a trophy. The trophy is a palio, a banner cherished by the winner of the competition. It bears the image of the Blessed Virgin Mary. When we visited, La Girafa ward had just won the banner. 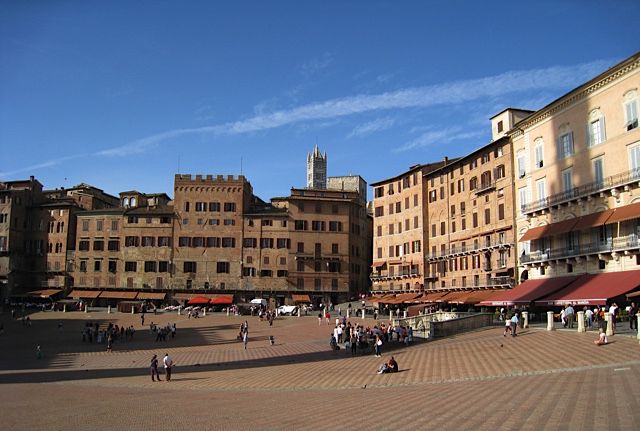 You may recognize the Piazza del Campo from a scene in the James Bond movie Quantum of Solace. 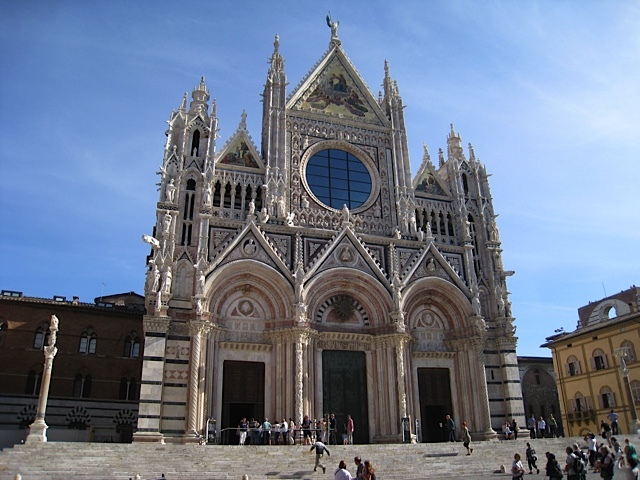 After we left the imposing, shell-shaped square of the Campo, our next stop was the Duomo, Siena’s cathedral. The white-and-dark green-striped church sits atop the highest point in Siena and is visible for miles. But what I was eager to see was the uncovered floor of the church, which can only be seen for six to ten weeks each year, generally including September. The rest of the year the floor is protected to guard it against the wear of visitors’ shoes. Once inside the church, it took a minute for my eyes to adjust to the change in light. When they did I was not at all prepared for the incredible work of art before me. The entire walking surface is a spectacular inlaid marble mosaic floor, the most ornate of its kind in Italy. Crafted by forty artists, the undertaking spanned the fourteenth to sixteenth centuries. The floor consists of fifty-six panels of different sizes—most rectangles and some hexagons or rhombuses. 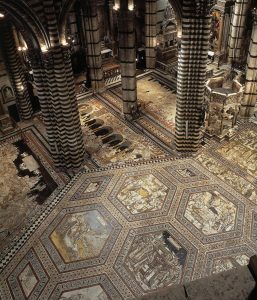 The panels create an interlocking marble carpet throughout the apse and the nave of the cathedral. They depict the sibyls, scenes from the Old Testament, allegories, and virtues. Most are still in their original state. After a long time staring at this masterpiece, I finally looked up and noticed the graphic effect of the black-and-white marble stripes on the walls and columns. Black and white are the colors of the civic coat of arms of Siena. My gaze followed this striking black-and-white combination to the vaulted ceiling, which is decorated in blue and adorned with gold stars. 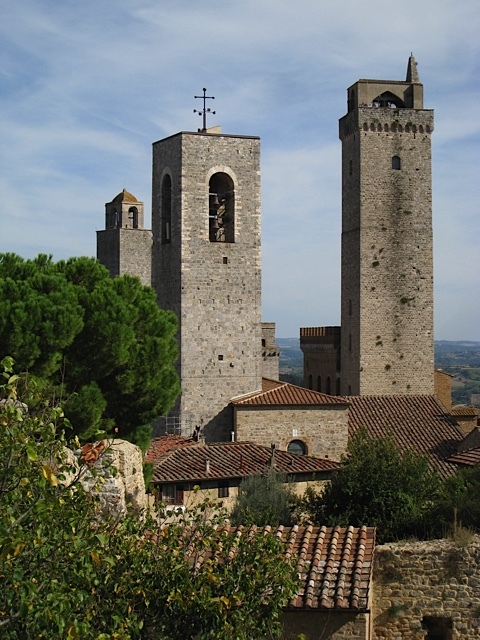 Our visit wasn’t rushed, but we did have lunch reservations, and it was time to leave the cathedral for our next stop on the tour, a working farm near San Gimignano. But first, the group made a detour for gelato. Surrounded by the picturesque Tuscan countryside, Fattoria Poggio Alloro is an organic farm with vineyards, olive groves, fruit trees, vegetables, saffron, and verdant pastures for their grazing herd of prized Chianina beef cattle, one of the oldest breeds in the world and at risk of extinction. The family-run farm also raises bees, chickens, rabbits, guinea fowl, and pigs. We lunched in the main dining room of the restored farmhouse, which overlooked undulating hills of row upon row of lush green vineyards. We began with bruschetta, followed by pasta with a meat sauce, green salad, and bread. And, of course, wine accompanied the meal, red and a white, the grapes grown and the wine bottled on-site. For dessert, almond biscotti to dip in the farm-produced grappa. Wisely, I sipped a half glass of wine throughout lunch and passed on the grappa, handing mine to the burly man seated across from me, who was happy to receive the liqueur. We still had an afternoon of exploring to do, and I wanted to be alert for sightseeing. 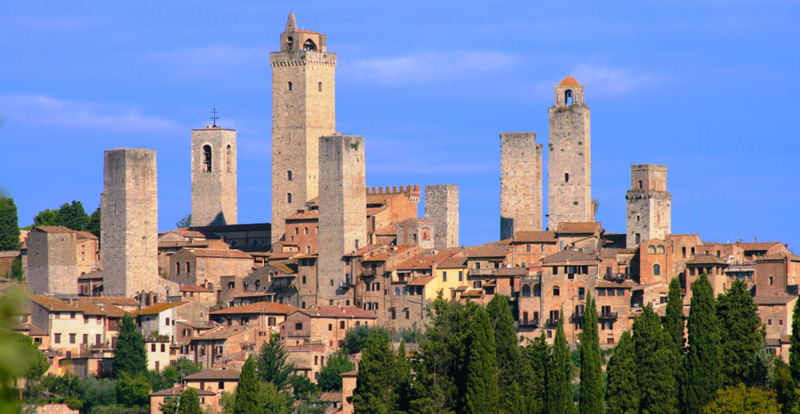 San Gimignano is a small medieval village located about halfway between Florence and Siena. The city was built atop a hill and has a panoramic view of the Elsa Valley. It was named in honor of Saint Geminianus, a bishop from Modena who is said to have saved the town from the invading Huns. 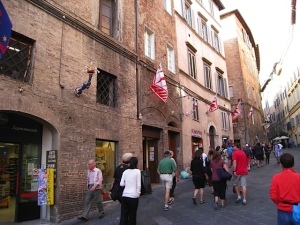 The village thrived the most in medieval times because it sat along the Via Francigena, an important pilgrimage route that connected Rome to Canterbury. When the many faithful set out on a pilgrimage to Rome, they needed overnight accommodations. We arrived in Pisa in mid-afternoon and took a leisurely walk around the cathedral square and snapped shots of the Leaning Tower. Besides the tower, what I really wanted to visit was the Jewish cemetery, just outside the Piazza dei Miracoli, but it was closed. Disappointed, we walked back to the buses and soon boarded ours for the return trip to Florence. Next week, Dubrovnik, Croatia. 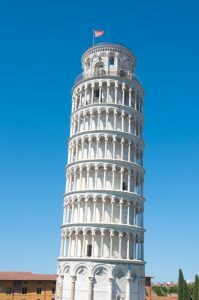 This entry was posted in Travel and tagged Europe, Leaning Tower of Pisa, San Gimignano, Siena, traveling, Tuscany on February 5, 2015 by Pat Krapf.